We’d love your help. Let us know what’s wrong with this preview of The Minus Faction by Rick Wayne. Capt. John Regent returns a paraplegic after months of captivity and torture—only no one knows who took him or how he escaped. Xana Jace strives only to be reunited with her son. She keeps her head down and stays out of trouble, which isn't easy when you stand seven feet eight inches tall. Ian Tendo's sensible life has fallen apart. After losing his girlfriend and being ar Capt. John Regent returns a paraplegic after months of captivity and torture—only no one knows who took him or how he escaped. Ian Tendo's sensible life has fallen apart. After losing his girlfriend and being arrested for terrorism, he doesn't imagine things could get any worse—until he's beset by an eleven-year-old prodigy with a foul mouth and an ambulance full of high explosives. One by one, all four are recruited by an enigmatic mastermind, known only as Prophet, who offers them everything they want in exchange for the impossible. But team is a four-letter word. After a botched mission reveals a plot to hack the human race, they discover a betrayal by one of their own—and realize that not all of them will survive. To ask other readers questions about The Minus Faction, please sign up. The most graphical text-only book I've ever read. I mean that. It's weird. Wayne's prose is like reading a comic. This isn't a bad thing, I love comics and The Minus Faction is right out of the Grant Morrison/Warren Ellis school of superhero story (and a higher compliment I can hardly imagine in this genre). What's odd is how graphical it feels to read - the text leaves me with the impression of a series of well defined images, just like in a comic. Most books don't do that, and it's a very inte The most graphical text-only book I've ever read. I mean that. It's weird. Wayne's prose is like reading a comic. This isn't a bad thing, I love comics and The Minus Faction is right out of the Grant Morrison/Warren Ellis school of superhero story (and a higher compliment I can hardly imagine in this genre). What's odd is how graphical it feels to read - the text leaves me with the impression of a series of well defined images, just like in a comic. Most books don't do that, and it's a very interesting effect. At first it's a little disconcerting, but after a while it's a real pleasure. Wayne has a light but skilled touch with the English language, conveying situations, action and - most importantly - character extremely clearly and deftly. The characters in particular are superbly constructed, even where there is a risk of them coming off a little cliche (especially the anime/comic standard kid hacker of near magical ability) they don't quite tip over into actually being so. You care about them and what happens to them, rather more so than the actual plot they're involved in. On the downside, it is slightly too long. Perhaps as individual novellas it works better but as an omnibus the pacing is a bit off. Wayne clearly loves his characters (and I do too!) and understands them deeply but there is a little too much backstory going on - again, as five books this might work better but it drags a bit in a single volume. On top of that the story loses it's way a little at times although even when it does the characters manage to keep your attention until things pick up again. The Minus Faction is a fun, action-packed story that mashes the concept of super-heroes with a modern world very much like our own. Wayne does a great job of introducing the would-be heroes, ordinary people who have or discover extraordinary abilities, and a large roster of super-powered villains as well. The closest entertainment I can compare this book to is the TV show Heroes, except there's no cheerleader, no limit on budget, and it doesn't fall apart the further along it goes. 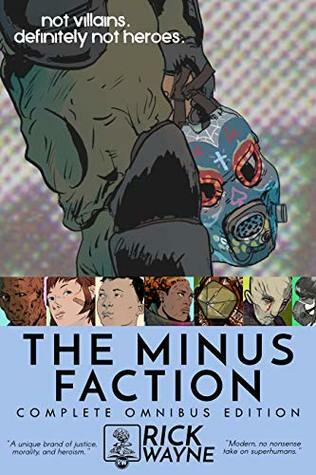 Recommended if The Minus Faction is a fun, action-packed story that mashes the concept of super-heroes with a modern world very much like our own. Wayne does a great job of introducing the would-be heroes, ordinary people who have or discover extraordinary abilities, and a large roster of super-powered villains as well. The closest entertainment I can compare this book to is the TV show Heroes, except there's no cheerleader, no limit on budget, and it doesn't fall apart the further along it goes. The kind of book I read and pass on, only to buy it again because I love it. Fast, interesting, complex. Gripping, nail-biting, page-turning book. Couldn't put it down. If anything, too much action and one challenge after another. Towards the end I found myself thinking: What? Not another disaster! But overall I loved it.